A westerly wind blows and the aspens quake in response. The trees sway with rhythm—back and forth, up and around, arms outstretched to touch their partners. Their little leaves chime with the movement, sounding the deep toll and the delicate whisper that give the wind its voice. She flicks her left ear forward and stretches her right ear to the side: she notices the dancing trees and can feel the wind deciding whether or not it wants to race towards her. A muscle engages along the top of her neck as she feels the still world come to life. The soft skin of her nose tickles as the wind meets her. Opening and letting in, releasing and letting go: her nostrils flare as her breath takes smoky form in the cool autumn air. The way of the horse is the way of nature: ever changing, yet always the same. Horses move with their world in response to the movement around them. They are fluid and free like the river that changes shape as it ruffles over and around the rocks that decide its course. Their energy is not something that we humans can see. It is something that, when we let go of our holds and conceptions of what should be, we are able to feel. Essentia Equi, Latin for “the essence of the horse,” is my artistic venture to represent through physicality what I feel emotionally within my work with equines. I notice lots of parts; I notice lots of layers, I notice patterns, and I feel how those parts and layers and patterns move into one another, on top of and beneath one another, when I open myself up to the horse’s experience. I use Essentia Equi to communicate what I feel with horses, for a picture is worth a thousand words. I work to communicate the blend of many truths and every shade of grey within the essence of the horse. I strive to capture the unique movement, fluidity and electricity that comprise the essence of the individual. Through this study, I have learned that horses must be granted the freedom to move and change as they need. I have learned that we are not so different and that I must grant myself the same right—this equality between species offers a true respect for life. I’ve been learning from these creatures for almost 20 years now. Horses have taught me how to live with harmony and freedom and, as such, my essence is inseparable from theirs. I have long since lost count of the number of times I’ve thrown a leg over the back of a new equine partner, the number of times I’ve been thrown from the back of an equine partner with different ideas from my own, or the number of times my heart has skipped a beat from the mere sight of one of these souls grazing in a pasture by the side of the road. I believe that very little of what we do with horses is in a position to be measured or quantified because their intense awareness of the world around them is extremely changing and fluid and the most that we can do as humans is to stick with them. My love for these magnificent animals is infinite and I am committed to sticking with them for as many more years as I have left on this Earth. I attribute my passion for our planet to the time that I have spent experiencing its landscape from the back of a horse and want nothing more than for my life’s legacy to be that I left this beautiful place a little bit better than I found it. At 25-years-old, I know a lot about horses and I know a lot about nature but I have not yet figured out how to bring this hands-on knowledge into the realm of environmental conservation. The Federation Equestre International announced Tuesday that Lexington and the Kentucky Horse Park are one of two candidates to host the 2022 FEI World Equestrian Games. The other candidate for host city is Samorin, Slovakia, about 4,800 miles away from Lexington. Lexington and the Kentucky Horse Park hosted the games in 2010, becoming the first venue outside of Europe to host the games and drawing attendees from 63 countries and all 50 states. The games, which are held every four years, include competitions in all eight of the FEI disciplines: jumping, dressage and para-equestrian dressage, eventing, driving, endurance, vaulting and reining. The FEI will conduct site visits between January and May 2017. Candidates will be required to submit their completed bids and sign the host agreement by June 2017, with formal presentations made to the FEI Evaluation Commission in the third quarter of 2017. The final decision will be announced in November. Samorin, Slovakia, was part of Czechoslovakia until the 1993 split of the Czech Republic and Slovakia. The town has more than 13,000 residents, including Hungarians, Slovaks and Czechs, and a large sports complex for professional and amateur sports, including Olympic training. The Longines FEI World Endurance Championships 2016 were held at the Samorin Equestrian Centre in September. The FEI Endurance Committee picked the Slovakian venue over sites in Fontainbleau, France, and San Rossore, Pisa, Italy. Kentucky did not pursue the 2018 World Equestrian Games after they were pulled from Canada in July because the state decided a last-minute bid would “put the commonwealth and the taxpayers at enormous financial risk,” according to a statement from the Cabinet for Tourism, Arts and Heritage. Bromont, Quebec, had been scheduled to host the games in 2018 but pulled out. Bromont had been awarded the games in 2014 over Kentucky. The 2018 games are to be held Sept. 10 to 23 at the Tryon International Equestrian Center in North Carolina. Ridgeway Rally is an annual event to rival no other. Ridgeway Rally is a three day riding competition covering 30 miles (48km) a day over the length of the Ridgeway trail. The 2017 debut event is March 26th-30th and is full; the 2018 event will be held March 25th-29th 2018. Entrants of the rally can expect four/five hours a day in the saddle, marquees on route for lunch and evening dining with ‘super’ chef’s. Chauffeuring from the riding route each evening to their no expense spared hotels each night, including dinner and entertainment at top 5 star hotels and an evening at Highclere Castle. The rally combines a superb riding competition with first class hotels and entertainment with world royalty and celebrity. The Wrangler Jeep and the Ridgeway rally gold cup goes to the winner. This event is exclusively high end. A combination of fitness and speed determines the winner. The Ridgeway is an ancient Roman trail covering some 89 miles. A mixture of mainly chalky tracks running along side open fields of crop land and rolling hills, this is the perfect traffic free riding terrain. All riders must be advanced and fit for this level of endurance riding. Riders and horses should be currently fit for riding five hours in trot and canter with no problem to be able to enter this rally. 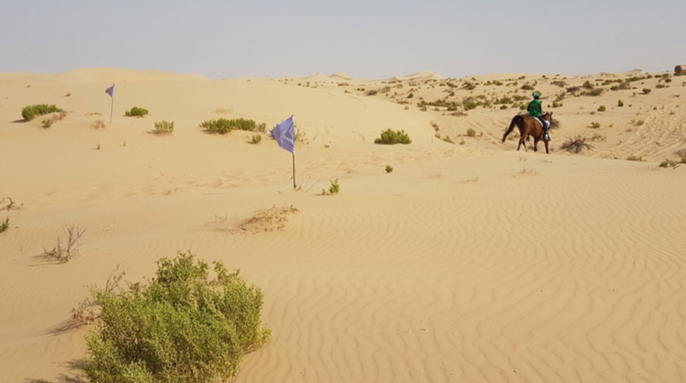 This event is also the perfect training ground for longer endurance rides and gives horses the opportunity to ride terrain they would not otherwise experience, especially horses and riders from the Middle East. The Endurance season is just beginning in the United Arab Emirates and once again, HH Sh Sultan and his team are showcasing the sport of Endurance at the Bouthib venue. With emphasis on horse welfare and 'fit to continue' criteria, Bouthib is forging ahead with its version of Endurance in the UAE. Recent changes in venue and trails are continuing the trend, with more spacious crewing areas to reduce stress on the horses, natural trails to introduce variety and challenge, and reduction of on-track crewing. "The course should include naturally occurring or manmade features such as (but not exclusive to) tracks, ditches, steep climbs, descents and water crossings that implements technically challenging factors including but not limited to: footing, terrain, altitude, direction and speed (art 801.2)". We are far from the compacted "hippodrome like" trails travelled by uninterrupted gallops. Natural course through the dunes. The FEI is to discuss with “urgency” the widespread use of severe bits at endurance rides in UAE, after images of a horse ridden by a former British team member caused a storm on social media. Emma Finnie, 37, an ex-pat working in risk management for the National Bank of Abu Dhabi, was photographed at Al Wathba on December 3 using a long-shanked curb bit and looped reins of the type associated with para-riding. Her horse also wore a flash noseband, which partially comprised a chain link. • Adam Casey was in the Marine Corps when he found out he had stage IV cancer. • He celebrated entering remission by racing in the Mongol Rally and Derby. It's difficult to tell where Adam Casey's story begins. Perhaps it's when he met a girl who changed his life and inspired him to start a nonprofit called I Do It For Her, helping at-risk youth in St. Louis receive a better education. Or when he enlisted in the military and became a First Lieutenant Infantry Officer in the Marine Corps. Perhaps it's when he was diagnosed with stage IV cancer. Georgie Barber is showing the older kids how it’s done on horseback. Last month the nine-year-old won the junior division of the South Burnett Endurance Riders Association event held at Nanango, for riders 17 years and under. The Dayboro Pony Club member was the youngest rider to complete the 80km ride, finishing the course in a time of 6 hours and 24 minutes. Over the past 12 months, Georgie has done ten endurance horse riding races, on three different horses. THE FUTURE of the Rattler might still be up in the air, but a plan to turn Imbil into a business and tourism hub shows the town has no intention of waiting. 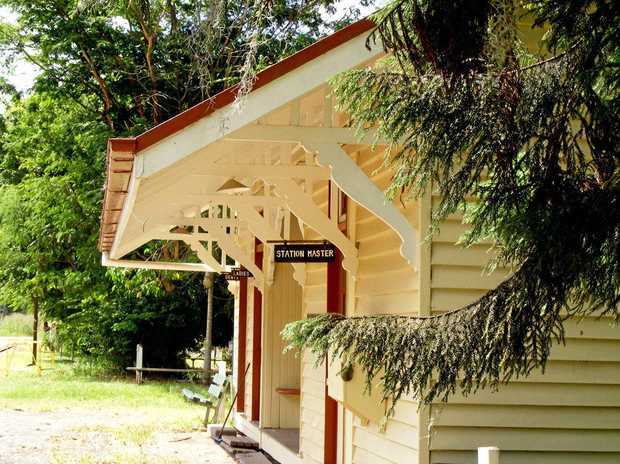 The Imbil Heritage Precinct will have the historic train station turned into a community recreational space, designed to showcase the region's history and establish a cultural centre for tourists and residents. Running under the auspices of the Mary Valley Chamber of Commerce, advertisements have already been posted for the position of project manager. Among the skills required for the role, applicants should be "motivated and decisive leader who is approachable, inclusive, good humoured and very much a team player”. The project still requires significant funding, but the Chamber of Commerce said they were committed to developing a precinct which would expand on the range of other attractions already situated in the Mary Valley. Mary Valley Chamber of Commerce acting president Karen Phillips said the plan demonstrated considerable foresight, especially in light of the recent denial of state funding for the revival of the Rattler this year. Marlborough rider Linda Harmon claimed a notable victory over a strong field at the Marlborough Endurance and Trail Riding Club's Seaview event, near Seddon, over the weekend. Forty five horse and rider combinations took part, with the pinnacle event being the CEI (International) 1* 80km endurance competition on Saturday. Significant developments have been made in African horse sickness (AHS) that will support the safe, direct exports of horses from South Africa. South African horse exports have been affected by AHS since the 1960s. The country is currently losing out on investment because of the onerous and expensive process of importing horses from South Africa, therefore, key stakeholders in the industry have been working to find long-term solutions to these challenges. “Our research findings will enable the export of South Africa’s sought after racehorses, endurance horses, and sports horses. The depreciation of our currency also augurs well for this industry. We are currently exporting horses to the value of around R250 million per year but this can easily increase to R1 billion,” says Prof Ian Sanne of the Wits Health Consortium Equine Health Fund. 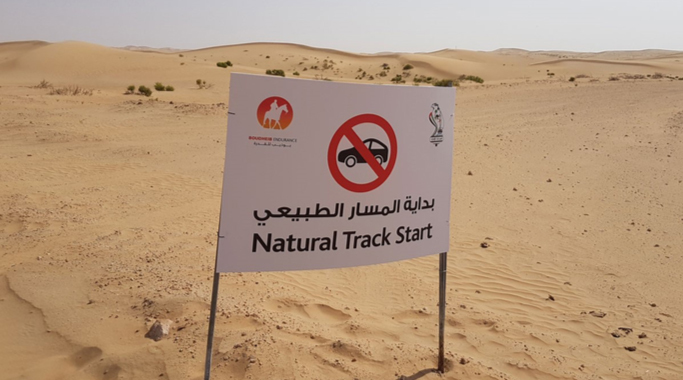 Sheikh Sultan Bin Zayed Al Nahyan, Chairman of Emirates Heritage Club in the UAE, has spoken of his Boutheib Initiative in endurance, and the steps he has taken to improve horse welfare in the sport. Sheikh Sultan was among the keynote speakers at this year’s World Horse Welfare Conference in Britain last month, and he spoke of his strong belief that endurance should not be about the first horse past the post but instead the horse in the best condition at the finish. In a sport which had been rocked by negativity over recent years, Sheikh Sultan presented a positive and forward-thinking approach with greater rules and regulation to protect horse welfare that has already seen success through a huge reduction in injuries and eradication of horse fatalities through the 2016 season. “Removing the focus on speed does not remove competition in endurance. The real competition should be about your horse finishing in the best possible condition,” he said.